Acer this week announced its new high-end gaming laptop, the Predator Triton 700. Designed to strike a balance between features and weight, the laptop features a quad-core Intel CPU, a yet unspecified NVIDIA GPU, 16 GB of memory, as well as a mechanical keyboard. Meanwhile the laptop measures in at just 18.9 mm thick and weighs around 2.6 kilograms, or roughly about the size of a mainstream notebook from a decade ago. 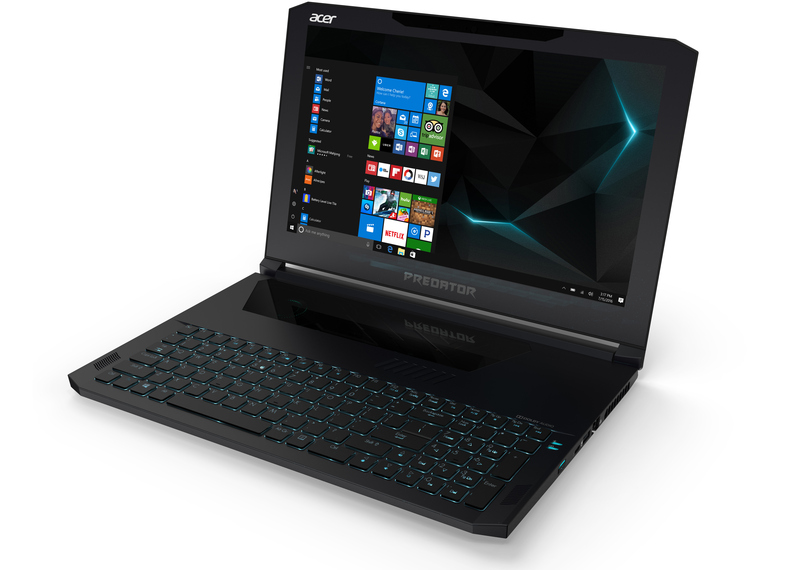 The Acer Predator Triton 700 comes with a 15.6” FHD display and is based on Intel’s Core i5-7300HQ or Core i7-7700HQ processor, depending on exact model. The laptop is equipped with 16 GB of DDR4-2400, up to two 512 GB SSDs, Rivet Networks Killer DoubleShot Pro network solution (featuring a 2×2 802.11ac Wi-Fi and a GbE controller), Thunderbolt 3 connectivity, and other features one would expect from a high-end laptop. In terms of overall design, the Predator Triton 700 is one of a number of recent thinner-and-lighter high-end gaming laptops to hit the market in recent years. As the popularity of gaming notebooks has continued to rise, various makers of such PCs started to diversify their lineups with thinner machines aimed at gamers, essentially splitting these niche products to classes that differ by performance and weight/dimensions. 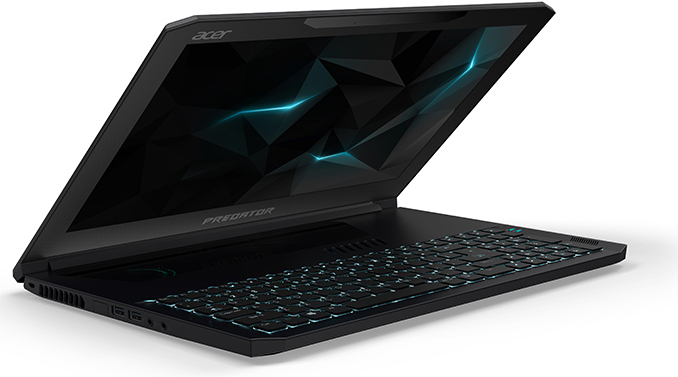 With the Predator Triton 700, Acer is looking to bring the performance of a gaming desktop to the “thin-class” gaming laptops, and gives us an idea what to expect from next-gen gaming notebooks in general. A feature of the Predator Triton 700 that Acer is especially proud of - and is a major component of allowing the laptop to be as small as it is - is its cooling system, which has five heatpipes and two thin AeroBlade 3D fans with curved metal blades that create increased airflow. A large Corning Gorilla Glass plate that acts like a touchpad covers the cooling system and the innards of the laptop, whereas the backlit mechanical keyboard resides towards the user, giving the system a very distinctive look. Meanwhile, one of the things that Acer is not disclosing are the graphics processors options available: the only thing we know is that the system runs an undisclosed GeForce GTX 10-series processor, and that the high-end configuration scores ~17,000 points in 3DMark11 (based on Acer’s presentation). Such a performance level is common for the NVIDIA GeForce GTX 1070 GPU (when working with the i7-7700HQ), but this GPU consumes 110 W of power, so it's not clear whether a 15.6”/18.9mm chassis with two blowers offers enough cooling capacity to prevent significant throttling. Typically, relatively thin gaming notebooks use GeForce GTX 1060 graphics chips with around 80 W TDP, but such GPUs hit around 12,000 – 13,000 in 3DMark11 (with the same CPU). It's highly probable that Acer will be offering a GTX 1060 version as a mid-range configuration anyhow, so the real question is what exact GPU will go into the high-end configuration. NotebookCheck.net speculates that the Predator Triton 700 is equipped with a yet unannounced version of NVIDIA’s GP104 GPU with a considerably reduced TDP. 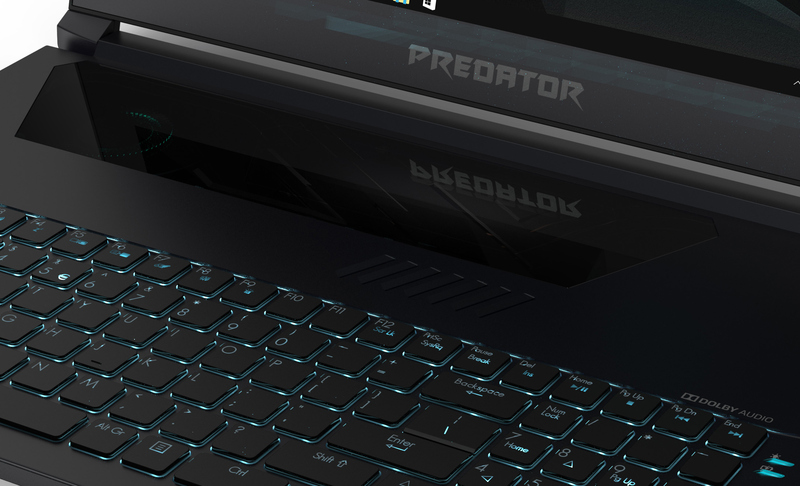 Wrapping things up, the Acer Predator Triton 700 gaming laptop will be available in Europe and North America this August. MSRPs will start from €3399 and $2999, depending on configuration, with exact specs and prices varying from market to market. Looks nice. I like the large translucent glass touchpad. Just prepare to wipe the drive and do a fresh install with manual installation of drivers if it's anything like other Acer laptops. I still can't figure out the hate for Killer NICs, I've got multiple computers here containing Killer NICs as well as Server and Consumer class intel NICs. This is one of those issues where if you're okay with it, twenty people aren't. Intel has a solid network adapter with a near perfect driver and apparently no conflicts, and is very happy to squish bugs. RealTek does a fairly good job too but I personally prefer Intel. I'm glad you've not had any issues with RealTek. Gives me hope that they'll one day be viable for me. However, every RealTek NIC I've tested (most recently about 7 months ago) shows inconsistent latency, problematic jitter, and most (not all) of the time, a mild to significant throughput deficit relative to the Intel, Atheros/Qualcomm, Broadcom, and Marvel counterparts (I've been testing periodically since the Athlon thunderbird days). So you don't have to deal with issues relating to downscaling when gaming on a GAMING laptop.